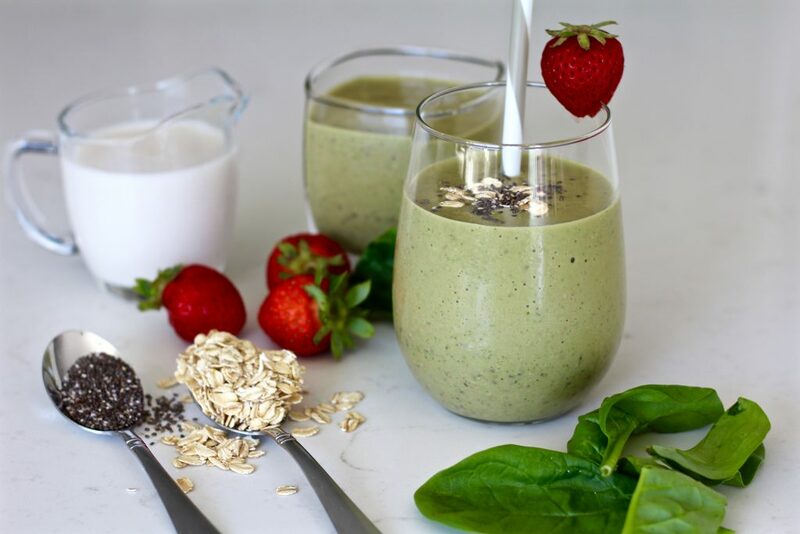 The thing that inspired me to create this strawberry oatmeal breakfast smoothie recipe was a desperate attempt to get my toddler to eat something healthy for breakfast. If you have a toddler, you probably feel my pain. One day they love oatmeal, the next day it’s the most disgusting thing you’ve ever given them (and they’re sure you’re actually trying to poison them with that mushy stuff). I was desperate to find something that she liked that was actually good for her. 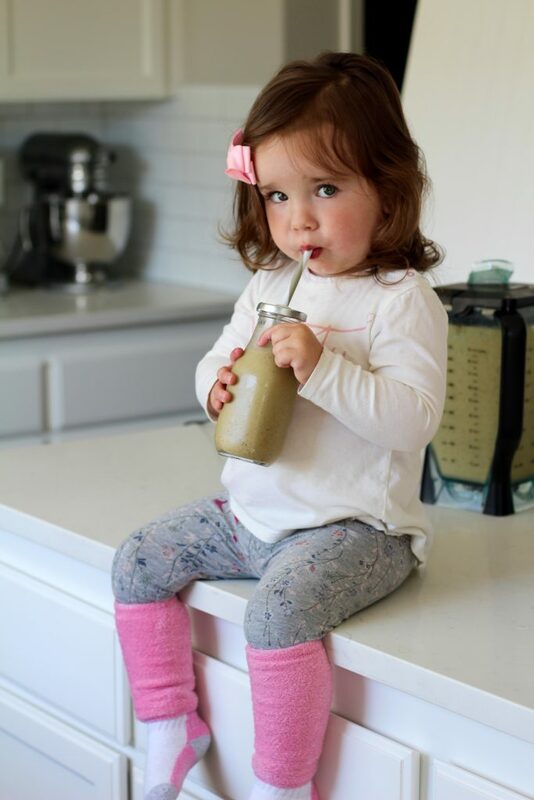 When I realized that my daughter LOVED smoothies, I took that as an opportunity to experiment and see just how many healthy ingredients I could sneak in and get away with. That’s why the ingredients list is a little long for a basic smoothie. 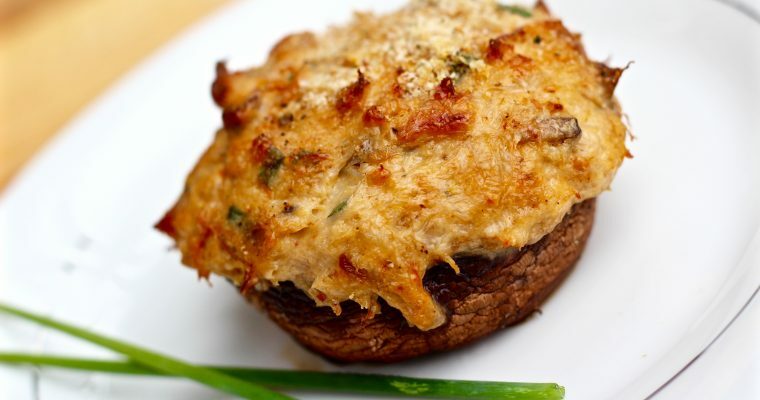 Try this out for breakfast and I bet even your pickiest eater will love it. 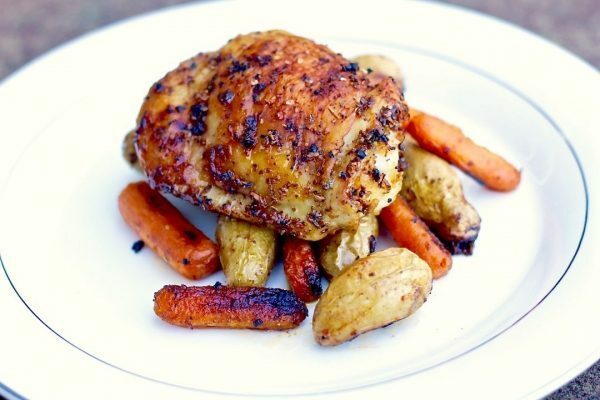 Makes about 4 8-oz servings or two large 16oz servings. Can be refrigerated overnight. Start with blending the oatmeal until it’s at a flour like consistency. This will help it mix in really well with all the wet ingredients. 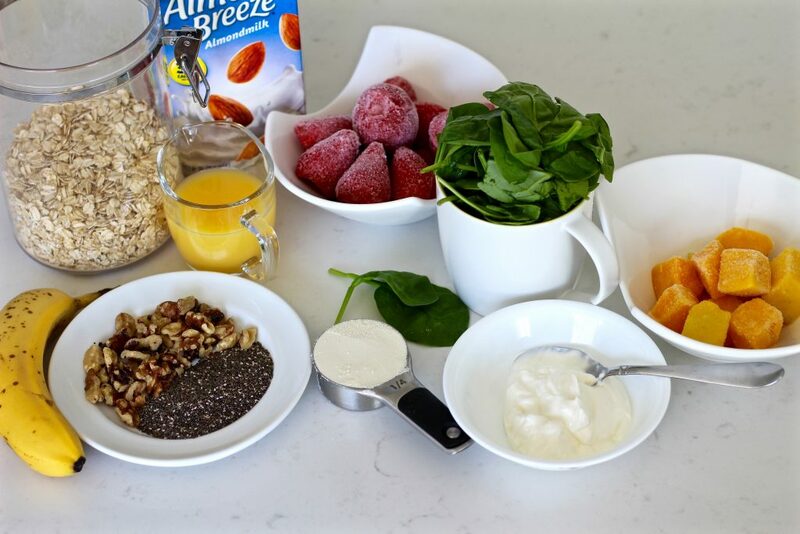 The oatmeal helps thicken up the smoothie and make it more filling. 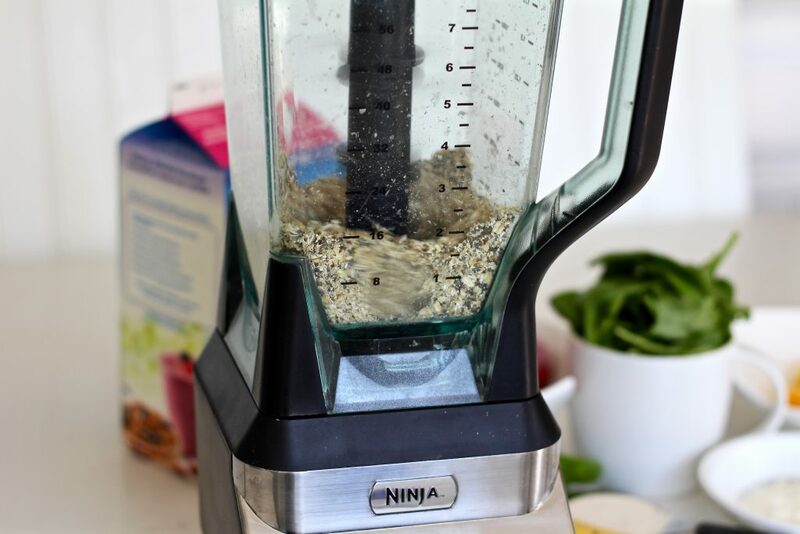 Then add walnuts and chia seeds and blend again. They are totally tasteless in a smoothie and are great sources of healthy fats and protein! 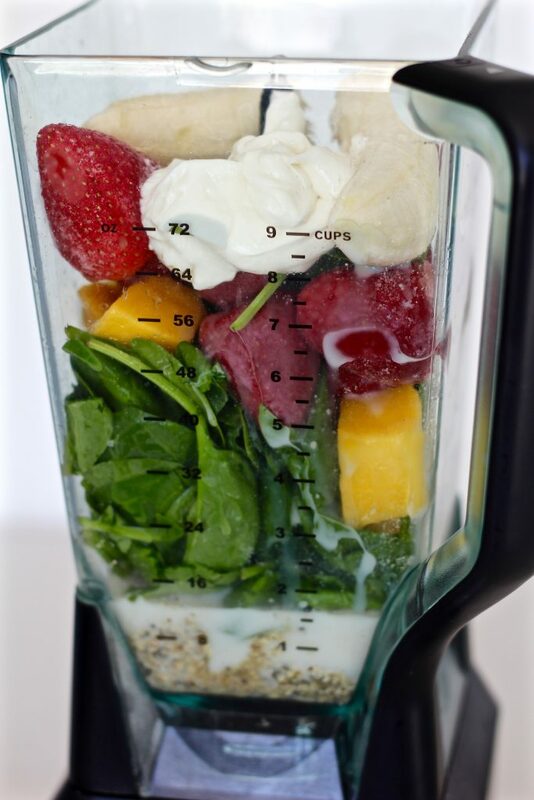 Next, add frozen fruit, banana, and spinach. I like using the frozen fruit because you can freeze your own when it’s in season OR whenever you buy it from the grocery store, you know it was picked in season. It also adds that refreshing cold element without having to water down the smoothie with ice. Feel free to pack in as much spinach as you can! 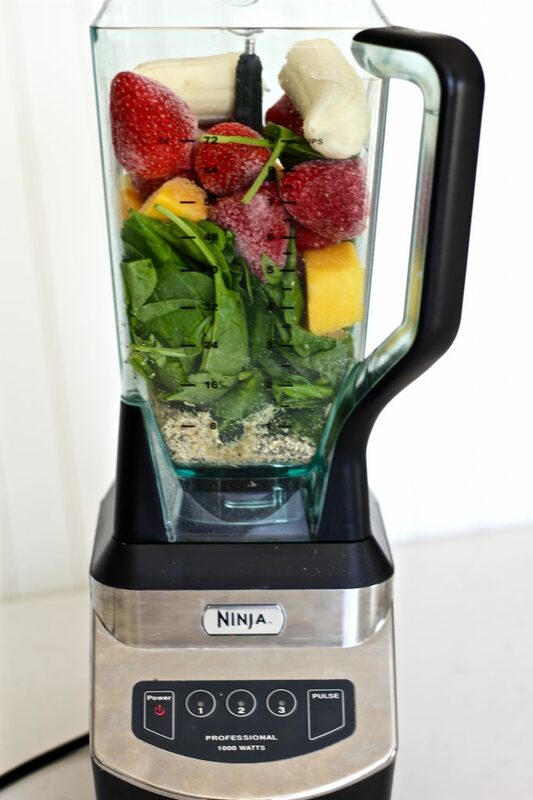 The only thing it changes is the color of the smoothie. Trust me, you can’t taste it at all! When else are you going to eat such a large amount of raw spinach, right? Pour liquids and yogurt on top. I used orange juice but you can use whatever juice you have on hand. Almond milk can be substituted with regular milk. Next, blend for about 2 minutes until mixture is smooth and no chunks remain. 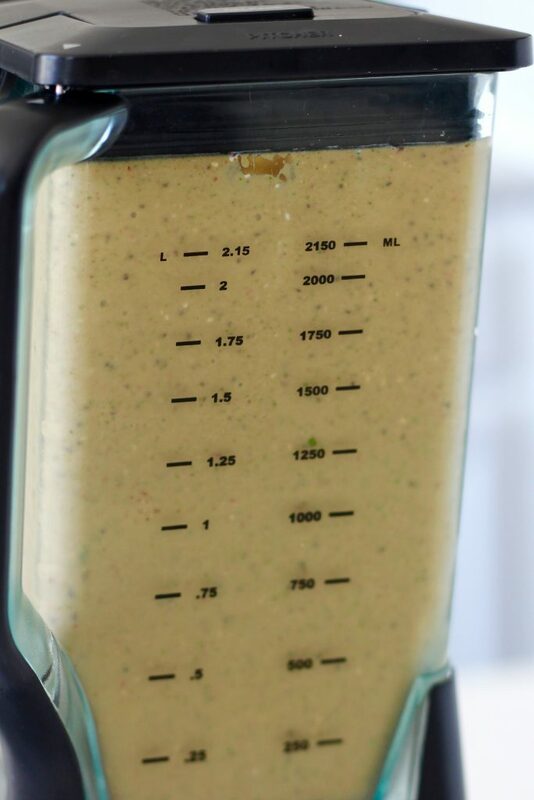 If your blender is having some trouble, you might need to pause it, add a little more liquid and help stir the ingredients a bit. 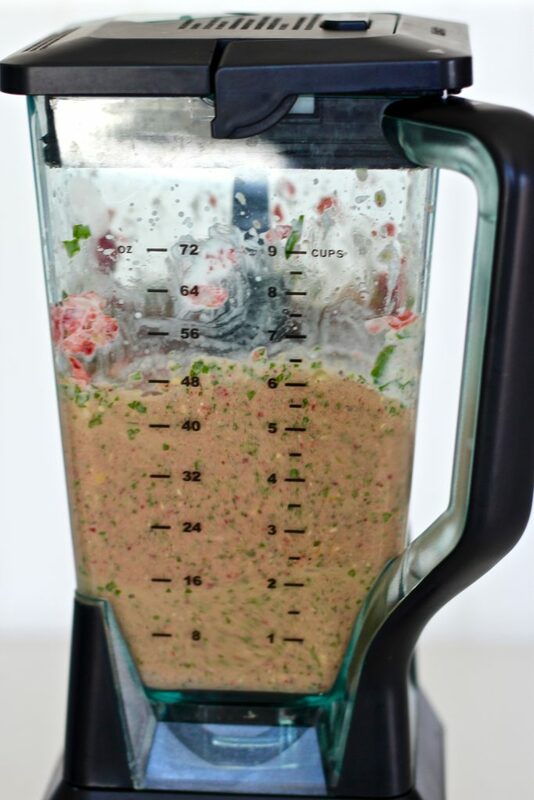 Finally, add whey protein powder and blend for about 10 seconds, just until it’s thoroughly incorporated. Don’t put the whey protein in with all the other ingredients in the beginning because it causes the mixture to get really whipped up and hold a lot of air. I’ve made this mistake before and I didn’t like the texture of my smoothie afterwards. Plus it expanded so much that two servings filled up the whole blender! 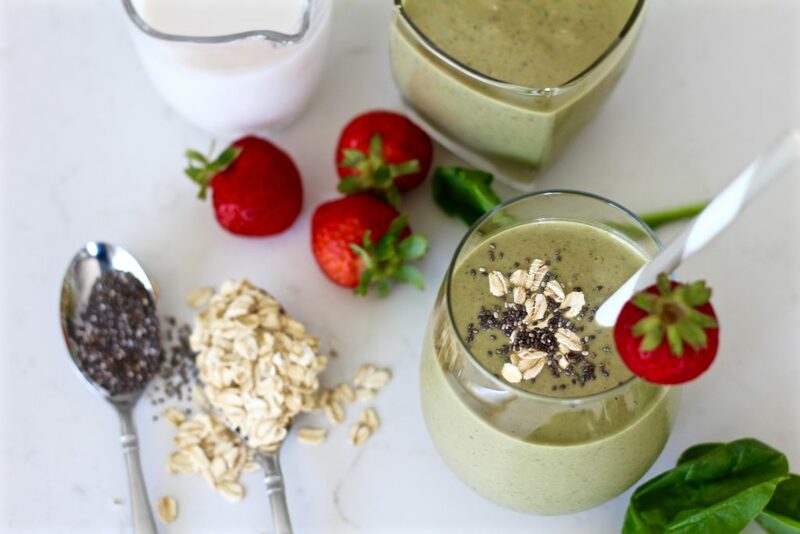 Serve this strawberry oatmeal breakfast smoothie for a quick breakfast on the go or a healthy snack any time! It’s super yummy and fruity despite all the other stuff that’s in there. The most prominent flavors are strawberry and mango. Yum! 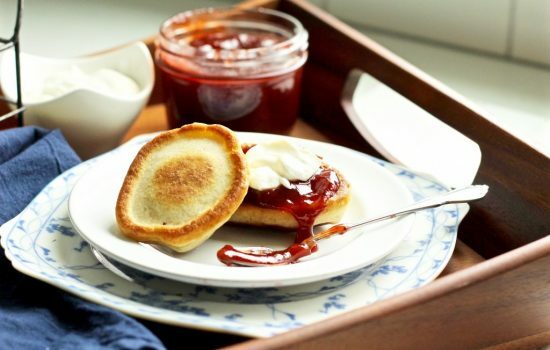 Serve for a quick breakfast on the go or a healthy snack any time! 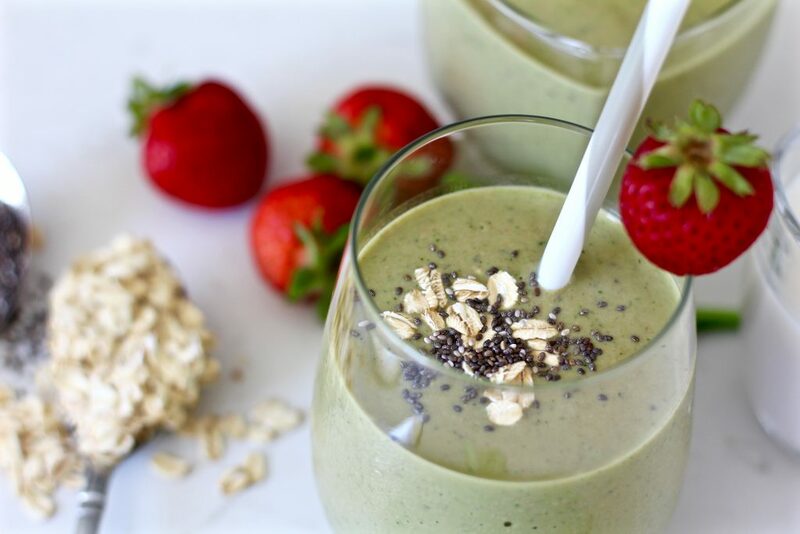 Love this recipe, so much so that I’ve included it in my list of favorite protein smoothies!